Astronauts aboard the International Space Station could soon benefit from boosted computing capabilities thanks to a major breakthrough from HPE. The computing giant has revealed it has completed test on a new system that could revolutionise the way computers are used in space, and is now teaming up with NASA to launch the devices. The new Spaceborne Computer recently finished a one-year test period, and is the first commercial supercomputer to survive the incredibly tough conditions seen on the ISS. 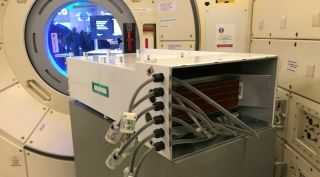 Based on HPE's purpose-built Apollo 40 HPC system the Spaceborne Computer is able to stay intact in space without requiring additional hardware, instead utilising a software-hardening approach that is integrated with its HPC nodes. Normal computing devices often struggle immensely when in space, with factors such as zero gravity, unscheduled power outages, and unpredictable levels of radiation all putting incredible strain on performance. The launch of a computing system that is able to withstand such conditions should prove to be a major boost to astronauts and scientists on the ISS, allowing them to run analyses directly in space instead of transmitting data to and from Earth for insight. Typically, running research on the moon or in low earth orbits (LEO) (anywhere between 400 and 1,000 miles above the Earth's surface), means that communication can be in near real-time with Earth. However the new kit will be specifically useful for capturing data father into space, especially closer to Mars, where larger communication latencies of up to 20 minutes both to and from Earth can occur. “Our mission is to bring innovative technologies to fuel the next frontier, whether on Earth or in space, and make breakthrough discoveries we have never imagined before,” said Dr. Eng Lim Goh, chief technology officer and vice president, HPC and AI, HPE.